(Washington, D.C., January 22, 2019). 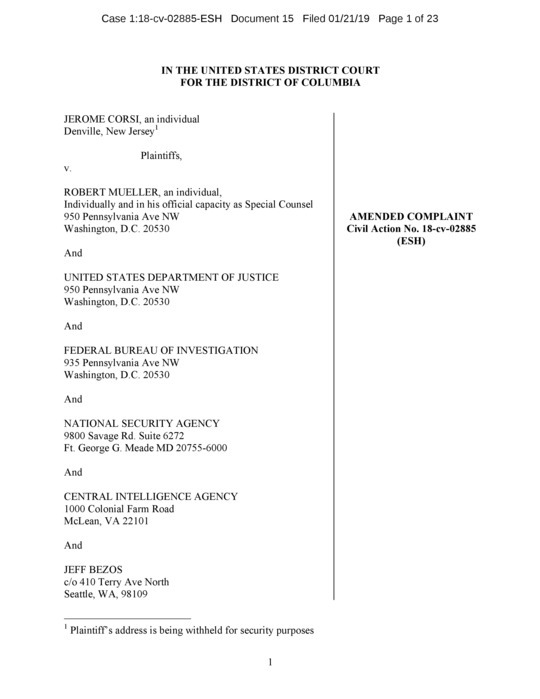 Today, Larry Klayman, counsel for Dr. Jerome Corsi, announced that he has filed an Amended Complaint on his client's behalf against Special Counsel Robert Mueller, the Department of Justice and its FBI, intel agencies, Jeff Bezos, the owner and CEO of The Washington Post ("WaPo"), Bezos's WaPo reporter Manuel Roig-Franzia, all of whom are alleged to have acted and continue to act in concert to coerce, extort and blackmail Dr. Corsi into providing false testimony under oath to the Special Counsel with the design to indict and/or remove President Donald J. Trump from his duly elected office. "There is a coordinated effort by the Defendants to indict and/or remove the president from office. Dr. Corsi, my brave client, has been coerced, threatened and blackmailed into providing false testimony which Special Counsel Mueller intended to use to accomplish this design. But rather than caving in to the threat to indict Dr. Corsi if he did not 'play ball' with the Special Counsel or be indicted himself, Dr. Corsi refused and would not accept a so-called 'sweet heart' plea deal, which would have allowed him to plead guilty to one count of perjury, a felony, with a recommendation for no prison time. 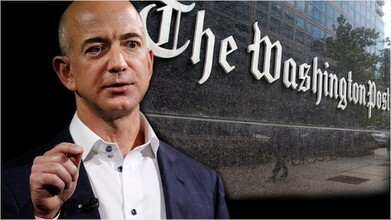 "Now, ratcheting up the coercion and blackmail, the Special Counsel in this coordinated effort with the new Defendants Jeff Bezos and his WaPo reporter Manuel Roig-Franzia, have 'upped the ante.' They too, along with Mueller and the other Defendants, will be held legally accountable for their despicable and illegal acts."